Stuttgart. Dr. Ing. h.c. F. Porsche AG, Stuttgart, is continuing to extend its performance and high efficiency competence via intensive development work in the field of hybrid technology. 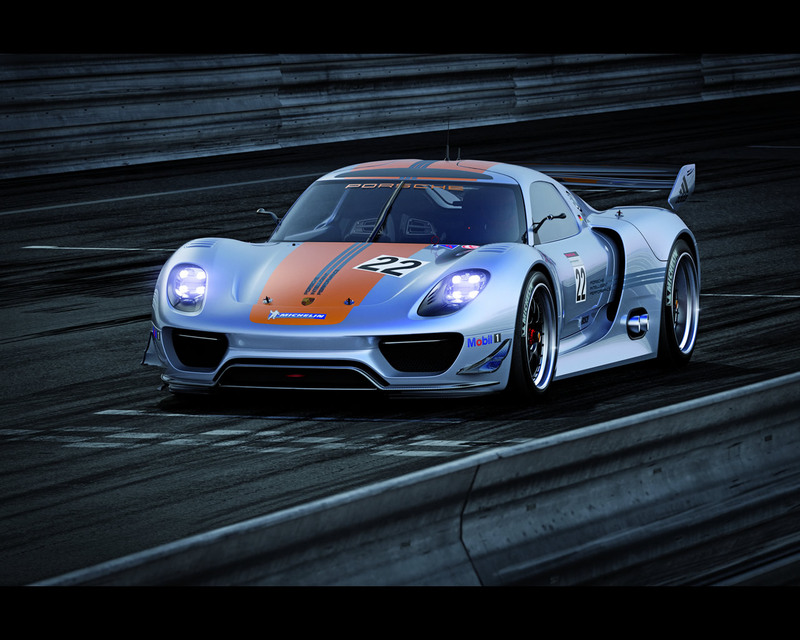 With the Porsche 918 RSR, the manufacturer of sporty premium vehicles is presenting a high-end synthesis of 2010's successful hybrid concepts. 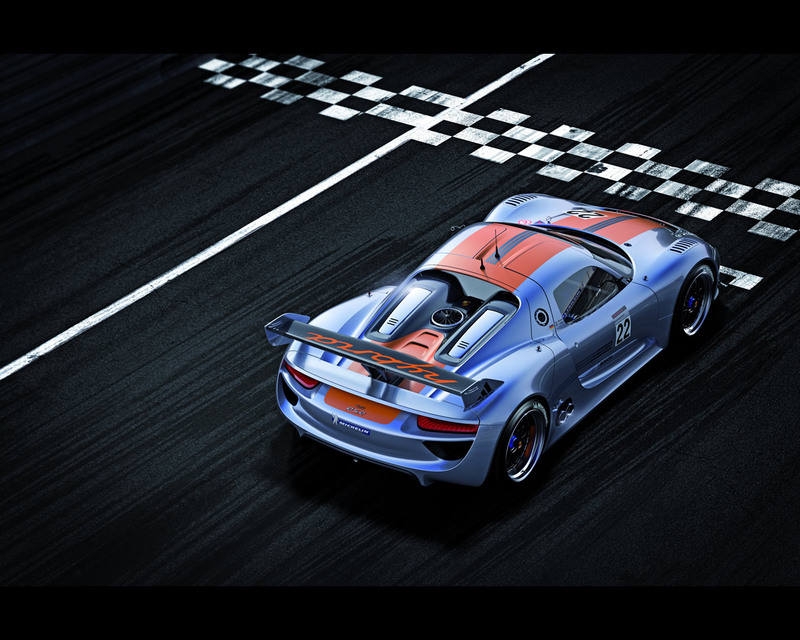 The two-seater mid-engine coupé 918 RSR clearly reveals what happens when the technology fitted in the 911 GT3 R hybrid and the design of the 918 Spyder are transferred to a modern, innovative super sports car. With its highly-efficient flywheel accumulator, the 911 GT3 R hybrid racing car proved to be an attention magnet during competition racing on the Nürburgring Nordschleife circuit, during the American Le Mans Series races (ALMS) in Road Atlanta/USA and the ILMC run in China's Zhuhai. 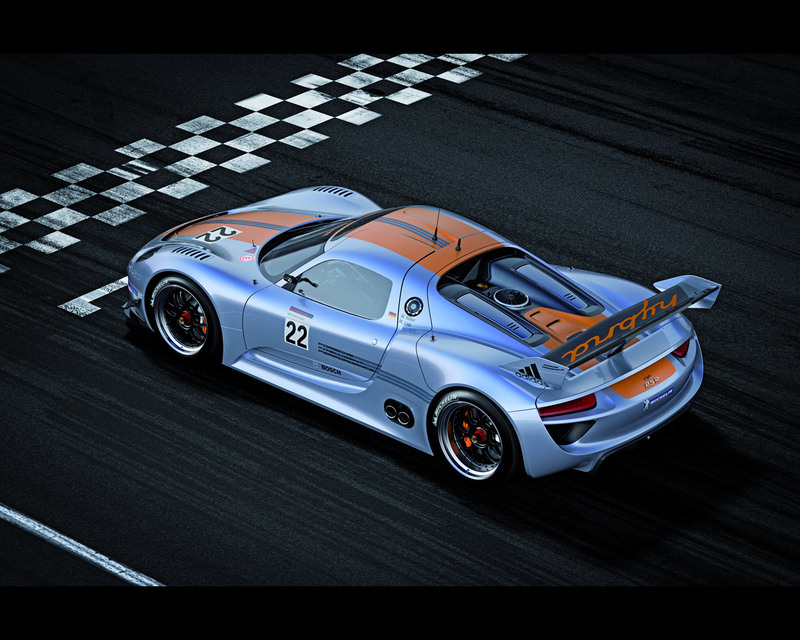 It demonstrated its massive performance potential under realistic motor racing conditions against top competitors. The 911 GT3 R Hybrid, referred to internally as the "Race Lab" actually surpassed the high expectations of Porsche Motorsport. Competitiveness, high reliability and exemplary fuel efficiency combined with top performance underscored the Porsche technicians' basic idea of generating additional power in an intelligent manner. The 911 GT3 R Hybrid obtains its additional power from its own vehicle dynamics when braking. 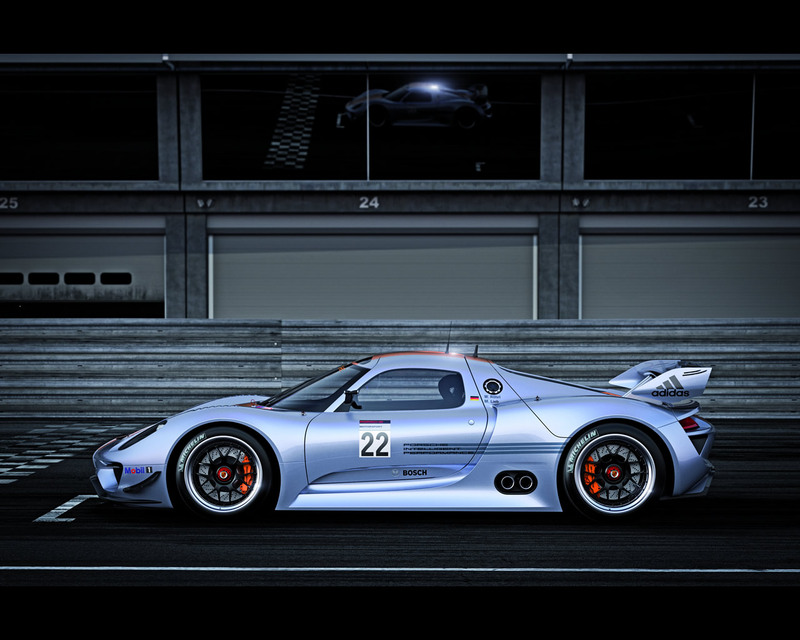 Porsche is now transplanting this technology into the mid-engine coupé 918 RSR, the motor sports version of the 918 Spyder concept car. From the tradition established by classic Porsche long-distance race cars such as the 908 long-tale coupé (1969) and the 917 short-tail coupé (1971), the Porsche designers created a link to the postmodernism of the "form follows function" philosophy. 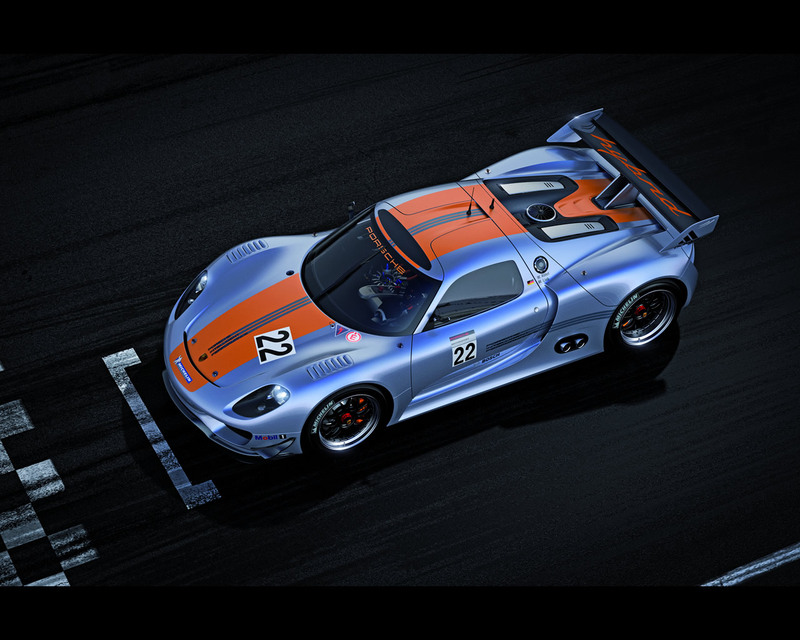 In the 918 RSR, the lines' elegant flow is dominated by muscular wheel arches, dynamic air intakes and a pulpit-like cockpit. A visible fan wheel between the ram air intake tubes and a rear spoiler with RS Spyder dimensions additionally emphasise the racing laboratory function. The new "liquid metal chrome blue" colour which has been created underscores the sculptured curves of the forms, whilst the typical Porsche hybrid orange colour on brake calipers and the body's longitudinal stripes lends remarkable touches. Motor racing technology also dominates within the particularly light, torsionally stiff carbon fibre-reinforced plastic (CFRP) monocoque. The V8 engine is a further development of the direct injection engine from the successful RS Spyder race car and now offers an output of precisely 563 hp at 10,300/rpm in the 918 RSR. The electric motors on the two front wheels each contribute 75 kW, i.e. a total of 150 kW, to the peak drive power of exactly 767 hp. This additional power, which is generated during braking, is stored in an optimised flywheel accumulator. 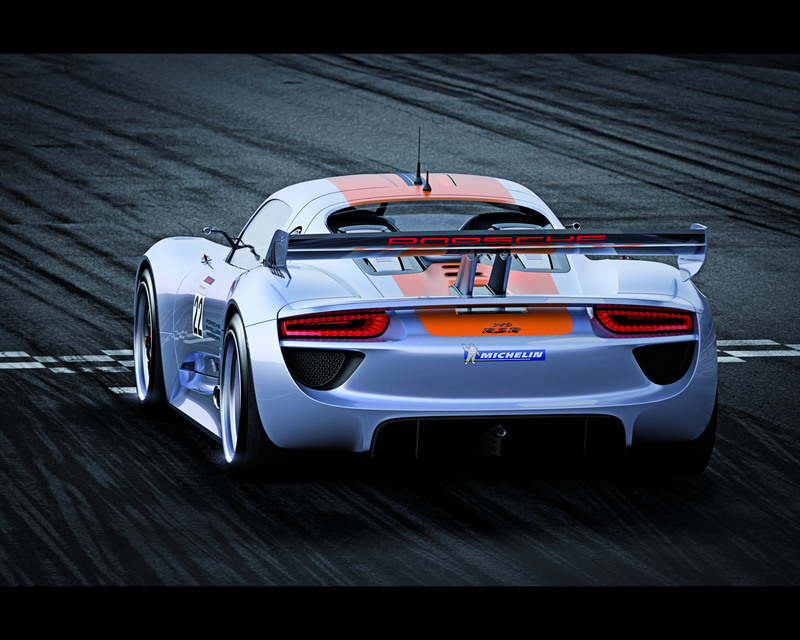 In the 918 RSR, the two electric motors offer a torque vectoring function with variable torque distribution to the front axle. This additionally increases agility and improves steering response. Mounted upstream of the rear axle, the mid-engine is integrated with a racing transmission also based on the RS Spyder race car. This further developed six-speed constant-mesh transmission with longitudinally mounted shafts and straight-toothed spur gears is operated using two shift paddles behind the racing steering wheel. The vehicle's functional equipment underscores its puristic motor racing character. Whether it be the characteristic doors which open obliquely upwards, the air intake in the roof between the wing doors, the quick-action locks on the front and rear CFRP lids, the two roof-mounted aerials for pit radio and telemetry, the RS Spyder-like small, lateral front flics or the air splitters beneath the front lip or no-profile racing slicks on 19" wheels with central locking, the vehicle can be clearly recognised as an experimental racing laboratory. 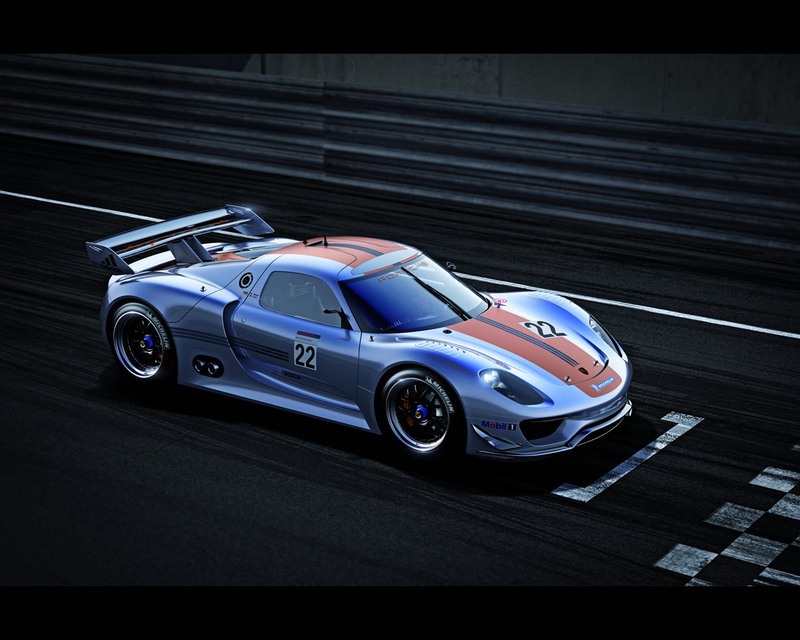 In contrast to the 918 Spyder concept car, unadorned racing atmosphere predominates in the interior of the 918 RSR. The figure-hugging bucket seat's brown leather covering cites the history of the gentleman driver; the gear flashes on the racing steering wheel and a recuperation display on the steering column in front of the display screen supply the pilot with information. Instead of the futuristic, ergonomically avant-garde centre console with touch-sensitive user interface from the 918 Spyder concept car, the 918 RSR's cockpit is split by a minimalistic console with rocker switches. Instead of a second seat, the flywheel accumulator is positioned to the right of the console. This flywheel accumulator is an electric motor whose rotor rotates at up to 36,000 rpm to store rotation energy. Charging occurs when the two electric motors on the front axle reverse their function during braking processes and operate as generators. At the push of a button, the pilot is able to call up the energy stored in the charged flywheel accumulator and use it during acceleration or overtaking manoeuvres. The flywheel is braked electromagnetically in this case in order to additionally supply up to 2 x 75 kW, i.e. a total of 150 kW, from its kinetic energy to the two electric motors on the front axle. This additional power is available for around eight seconds when the system is fully charged. In the successful 911 GT3 R Hybrid, this additional power can also be used as a consumption aid depending on the racing situation, e.g. to delay pit stops or reduce the fuel tank volume and therefore the weight of the vehicle. 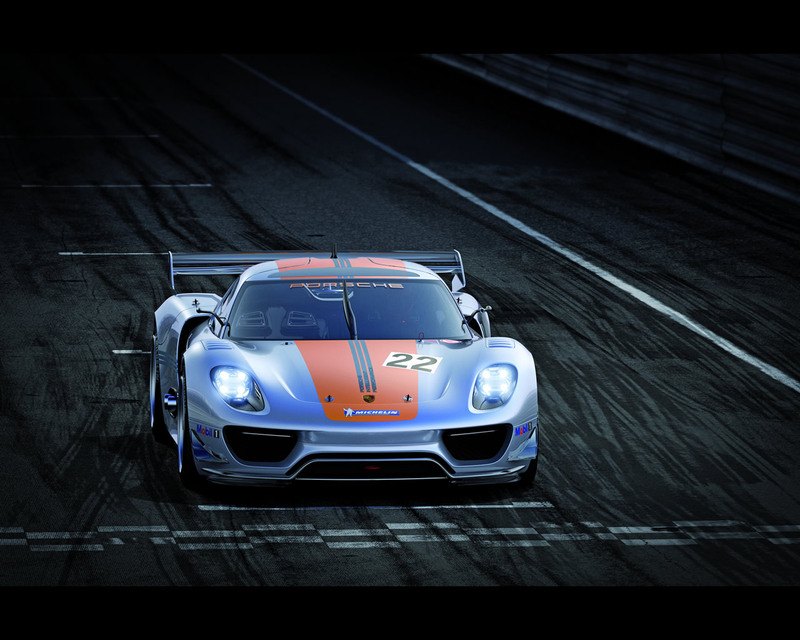 With the new 918 RSR racing laboratory, Porsche is now elevating this motor racing hybrid concept to an experimental level. 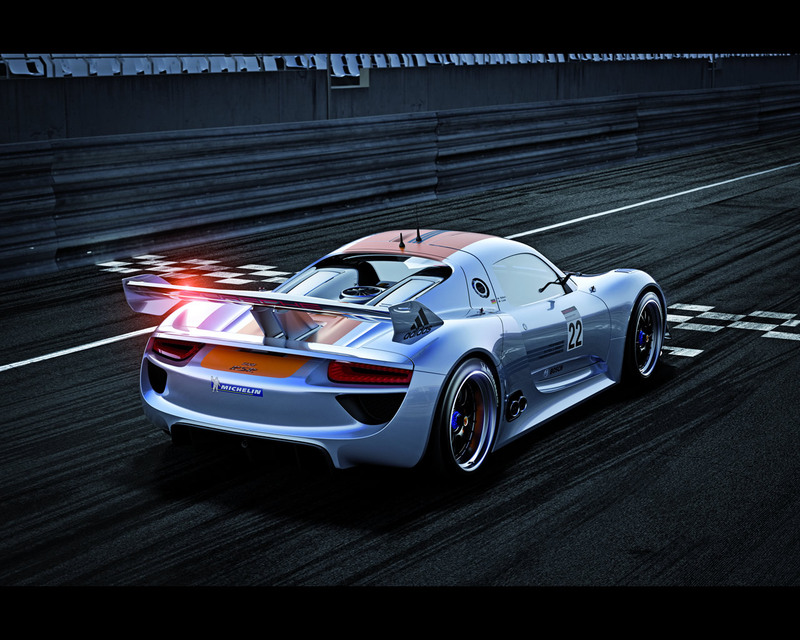 In the 918 RSR, "Porsche Intelligent Performance" equates to research into methods for further sustainable efficiency improvement under the intensified conditions of the race track, lap times, pit stops and reliability – a metier in which Porsche has been demonstrating its success for over 60 years. Finally, the starting number, 22, pays homage to the anniversary of a further triumph. Back in the days when overall victories in Le Mans were not yet an entirely routine matter within the Porsche racing department, the pilots Dr. Helmut Marko and Gijs van Lennep were the first to cross the finishing line in 1971's 24-hour classic. The distance record set by their Porsche 917 short-tail coupé – 5335.313 kilometres (3315.21 miles) at an average speed of 222.304 km/h (138.13 mph) – did not remain unbeaten for an eternity, but for exactly 39 years until 2010. At the time, the 917 in the Martini colours was also an experiment and far ahead of its time: a magnesium space frame set new standards in Porsche's lightweight construction domain.